A friend of mine asked me to create a dessert for a six-course dinner he was serving. Since mine was the last of some very impressive (and somewhat heavy) dishes, I wanted to make something light and fruity. 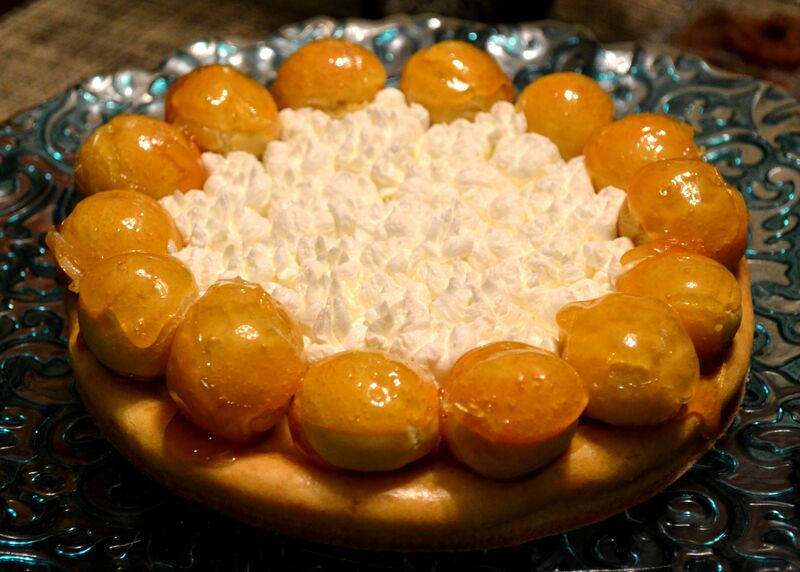 I chose this recipe from Classic Charleston Desserts. Specifically, it’s from the Kiawah Resort. Right off, I’ll tell you that the recipe itself has a few “problems”. Some of the mousse directions are questionable and the assembly directions actually create the cake upside down, if you follow them exactly. The directions here have been modified. Overall, the cake turned out well and dinner was a success. Well done, Rick! Preheat over to 400 degrees. Line two half-sheet pans with parchment paper. 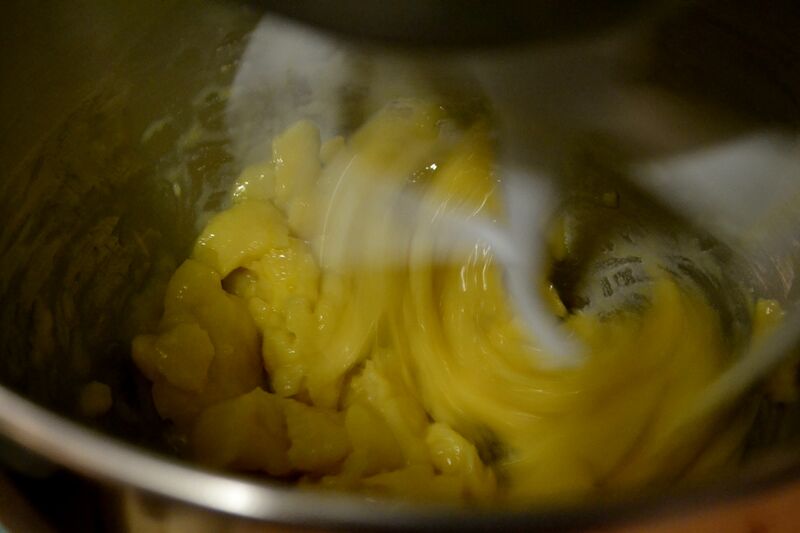 Combine the egg yolks, whole eggs and sugar and mix with an electric mixer at high speed until batter falls in ribbons. Sift the flour and cocoa together and gradually fold into the egg mixture. Be sure to fold thoroughly so there are no pockets of powder hiding in the mix. 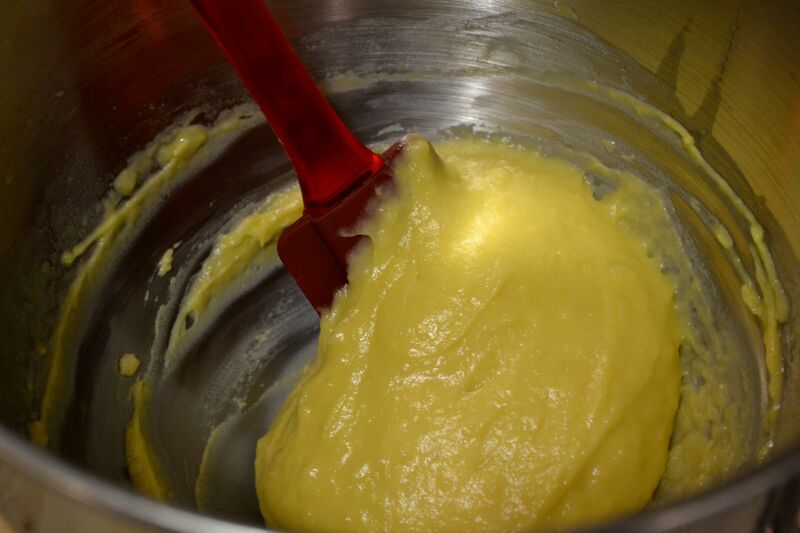 In another bowl, beat the egg whites, 1/3 of the sugar and the cream of tartar until it forms stiff peaks. Fold the egg whites into the batter gradually. 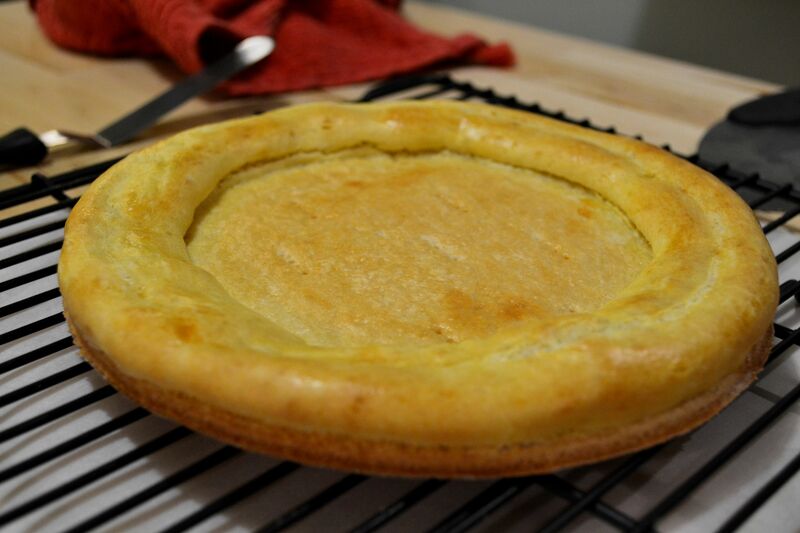 Divide the batter evenly between two pans. Bake for 10 minutes. Rotate and bake for another 10 minutes or until the cakes are springy to the touch. Cool on a rack. Once cool, remove the “skin” from both cakes so that each cake is as light as possible. Set aside. Sprinkle the gelatin over the water to dissolve. 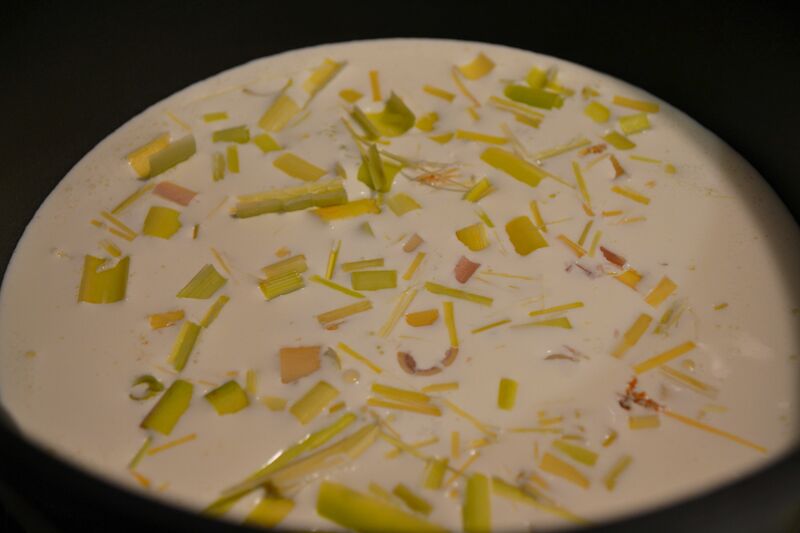 Combine the milk and key lime juice in a small pan and bring to a boil. Combine the egg yolks and sugar in another bowl until well combined. Pour a small amount of the heated egg mix into the sugar egg mix to temper the eggs, then pour it all into the saucepan to cook. Heat to 184 degrees. Add the gelatin and stir to dissolve completely. Cool the saucepan in a bowl of ice. (This last bit of instruction is from the recipe book but, better yet, use a bain marie to heat the custard. Mix with an electric mixer until it develops some body before cooling). Whip the cream until soft peaks form and fold into the cooled custard. Again, sprinkle the gelatin over the water to dissolve. Puree one cup of raspberries and strain to remove the seeds. Bring the raspberry puree to a gentle boil in a saucepan. Combine the eggs yolks and sugar in another bowl. Pour a small amount of the heated puree into the egg mix to temper the eggs, then pour it all into the saucepan to cook. Stir gently until it reaches 184 degrees. Stir in the gelatin until it’s dissolved. Remove the thickened custard from the stove and let cool completely. Whip the cream in another bowl until soft peaks form and fold into the cooled custard. Set aside. Combine the sugar, water, salt and cocoa in a saucepan and stir until thickened. Again, this is from the recipe book, but half the sugar would do. And you might need to add some Arrowroot or Corn Starch or you’ll be stirring all night. Cool in the refrigerator overnight. To assemble, lay a layer of cake on parchment paper. Spread the raspberry mousse over the cake thickly and evenly, then layer with the second cake. Spread the key lime mousse thickly over the top. Put the cake in the freezer for at least 24 hours. 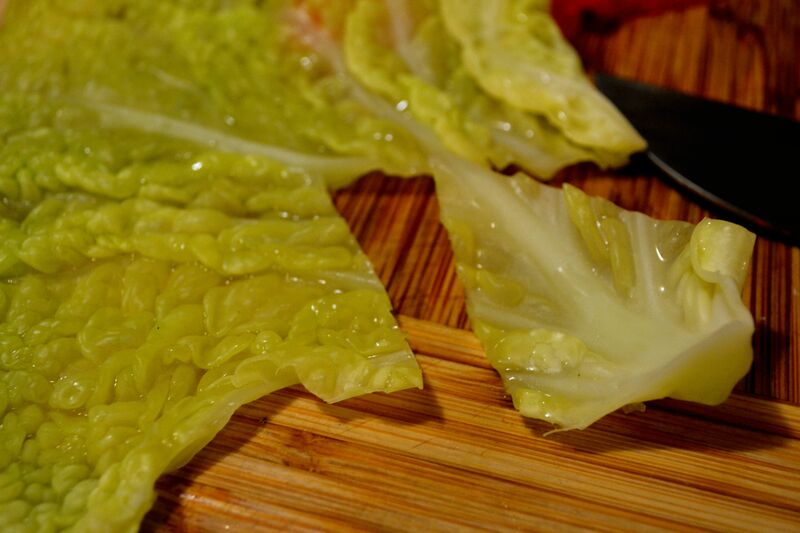 When frozen, trim the edges (run a serrated knife under hot water and wipe dry each time). Score the top before cutting so your pieces are even, then cut into even pieces. Top with raspberries and serve with the chocolate sauce and espresso. Enjoy! Classic french brioche. Slightly sweet with a soft biscuit-like center and a crispy crust, it’s unlike any other dough. 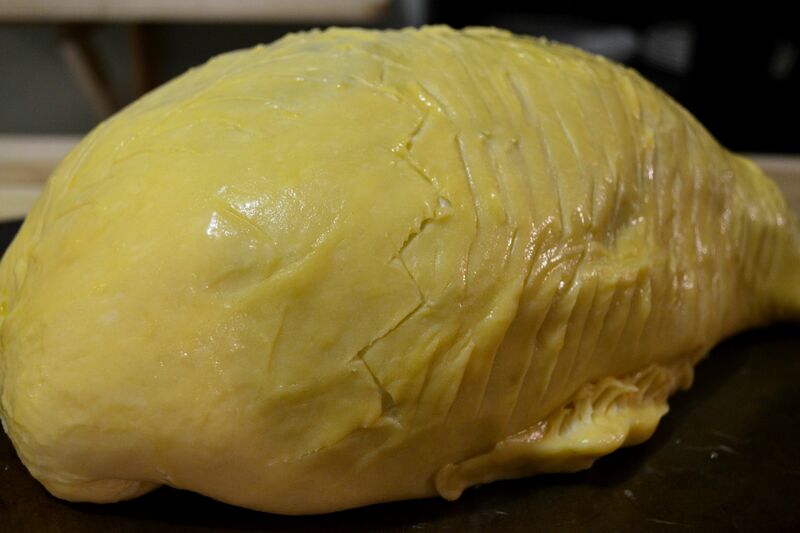 Of course, it’s also packed with butter and takes serious time to make. But that’s true of anything worth enjoying, isn’t it? Love doesn’t simply come as an end result; within the process of creation itself, there must be love. Magical brioche takes several hours and there’s no getting around it, so let’s just jump in with joyful anticipation. 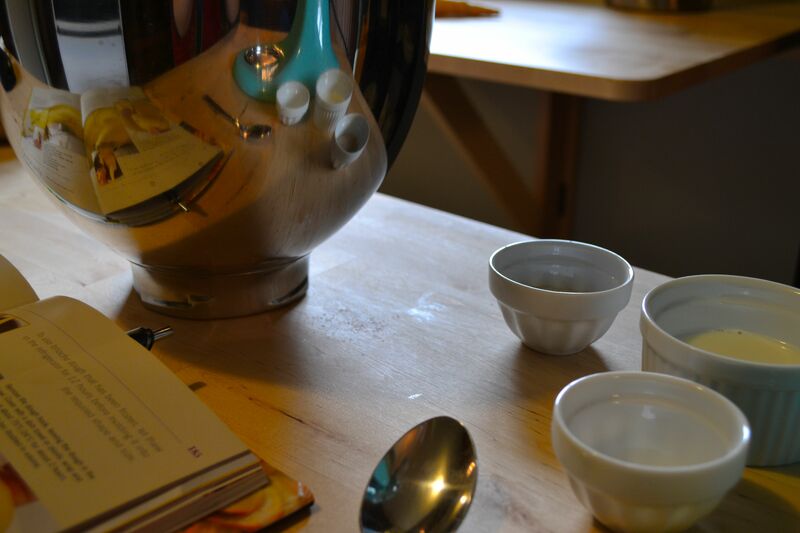 Put the milk and yeast into a bowl and stir to dissolve the yeast. 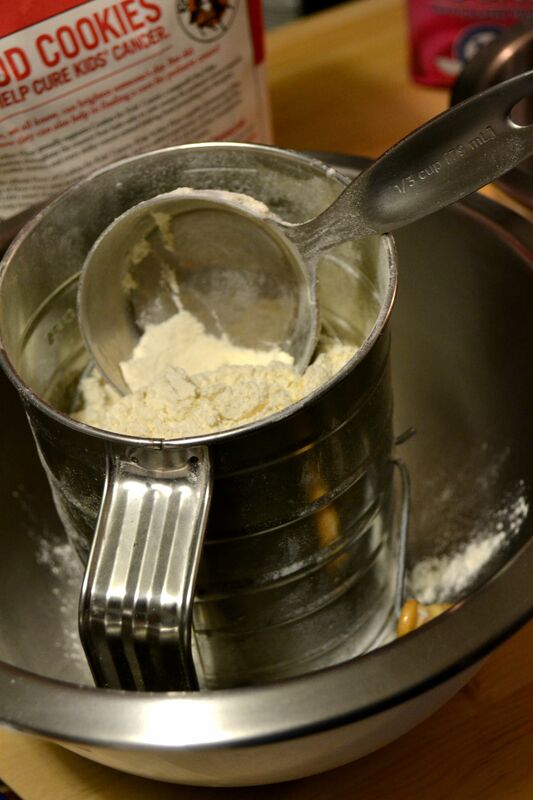 Put the flour, salt and eggs into an electric mixer fitted with a dough hook and pour in the yeast mixture. Mix on low to knead for 5 minutes. 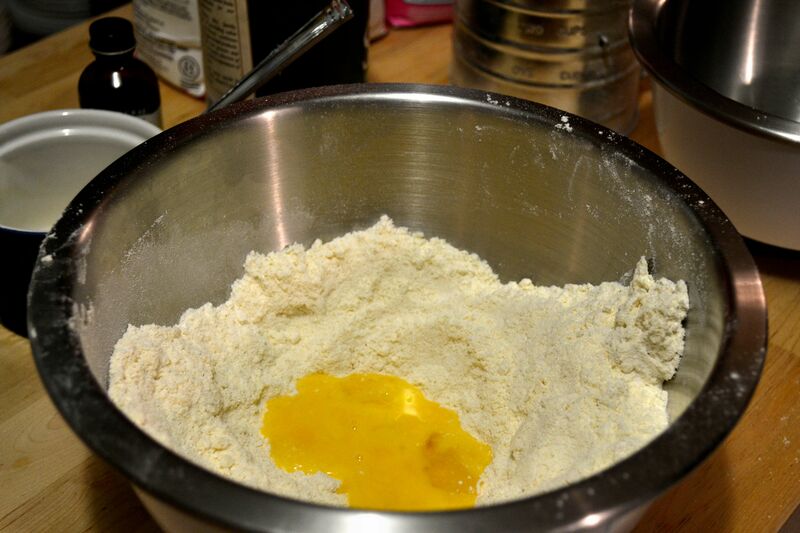 Scrape down the sides of the mixing bowl and knead for another 10 minutes on medium. The dough should be smooth and elastic. In a separate bowl, cream the softened butter and sugar together. I also added some springs of dill to mine. You can add other herbs as you like, but keep it mild so it doesn’t overpower the tender, buttery flavor. Add the butter-sugar mix to the bowl a little at a time as it turns. The dough should become glossy and smooth and come away from the sides easily. Remove the dough hook and cover the bowl with cling film. Let it rise for about 2 hours or until doubled in size at about 75 degrees. Making a proofer out of your microwave works wonders. Just microwave a small bowl of water for about 4 minutes until it’s nice and steamy, then put your bread in to rise. After 2 hours in the proofer. Knock the dough back down by turning it in the bowl. 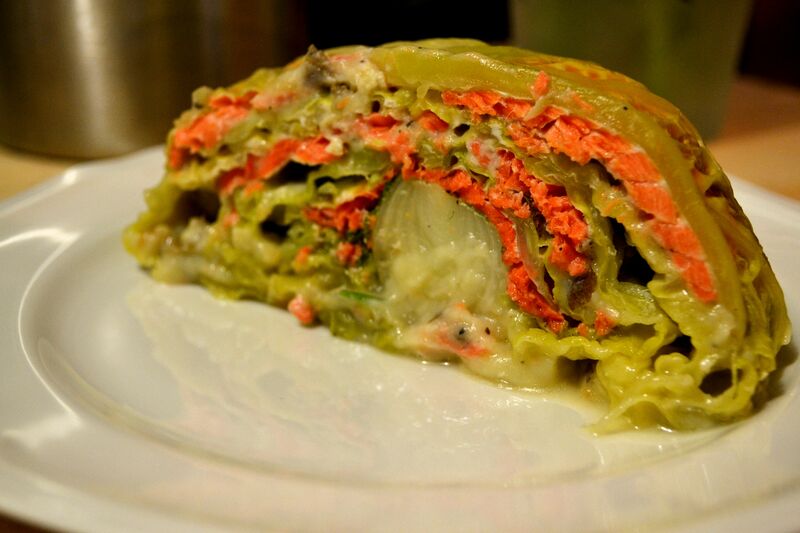 Cover and leave overnight in the fridge (not more than 24 hours). The classic French brioche form requires a brioche mold, of which I have ONE. It’s a small one, too. The rest of my dough is going to take other forms, but it’s all good. Whatever mold you’re using, butter it first. 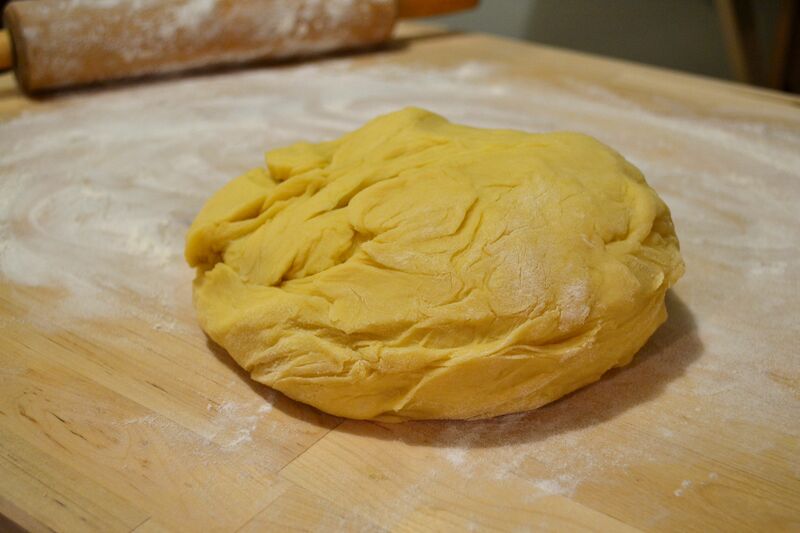 Shape your dough to fit and brush lightly with eggwash. Let it rise again. If you’re making small, individual brioche, let them rise for about 30 minutes each. A larger loaf may take 90 minutes to rise. Either way, the dough should just about double in size. 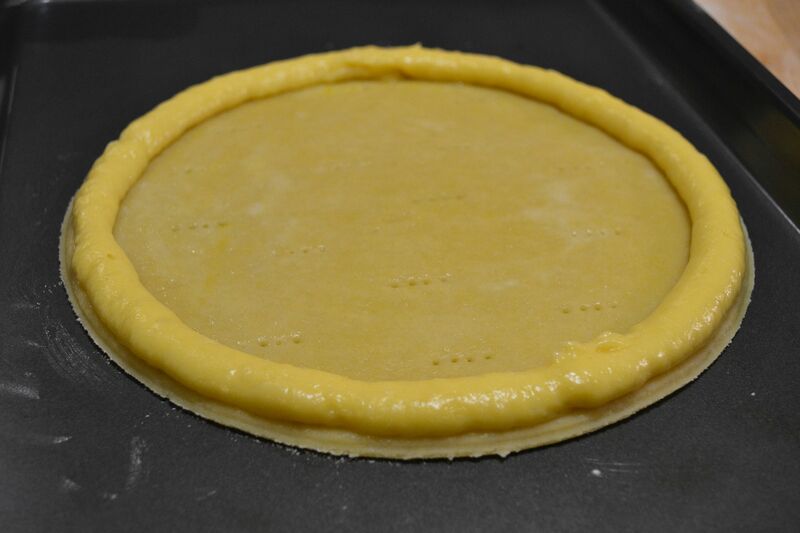 Make some “expansion cuts” in the top of your dough about 1/2″ deep before baking. A good pair of sharp scissors will work better than a knife since the dough is so soft. Bake immediately at 350 degrees. Larger brioche may take 30 minutes; small rolls may take 10 – 20 minutes. Just keep checking for the shade of golden brown you prefer. Let rest for 5-10 minutes before unmolding. Cool on a rack. Brioche can be served a thousand ways… with jam, more butter, sliced and toasted, topped with salmon and capers, goat cheese, made into hamburger buns (OMG! That’s good! ), or just warm, as is. Most importantly, it should be savored and shared. Enjoy! I’ll admit, I’ve been in a cooking lull. As much as I love the art of cooking in and of itself, I haven’t felt very inspired for awhile. Maybe the rainy Portland winter got to me; maybe it’s because most of the friends I share food with are dieting… who knows. This recipe is ideal to make as a group or a couple or even with kids because it doesn’t require a lot of concentration – it’s just simple and fun. 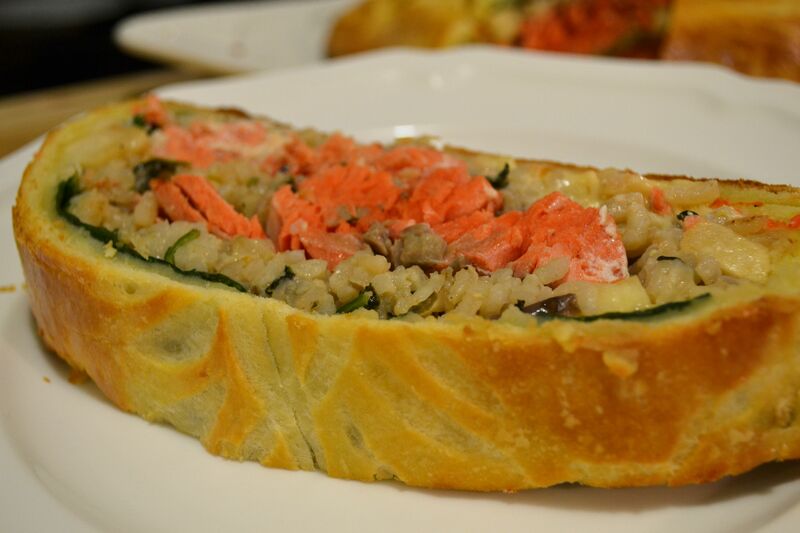 Paired with a tender white fish in a crispy wonton, it’s an appetizer or a meal in itself. Put all the ingredients (except the olive oil) in a food processor and blitz. 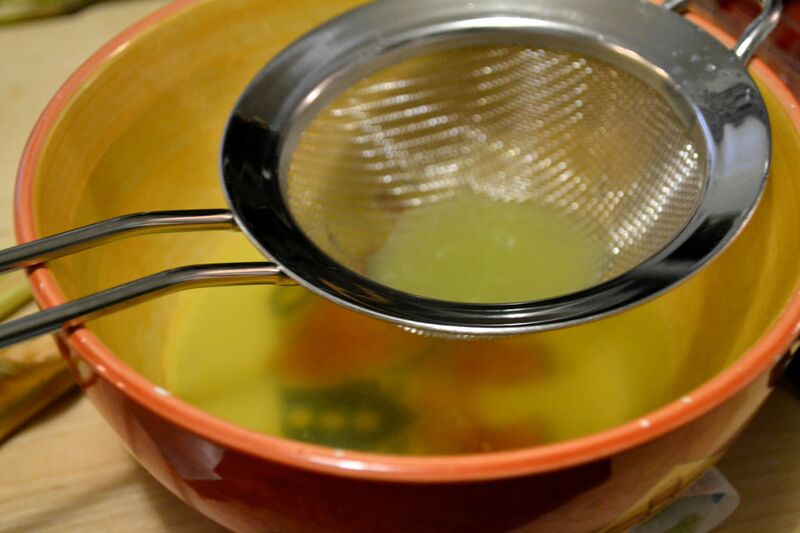 Add the olive oil as you’re blending to emulsify. 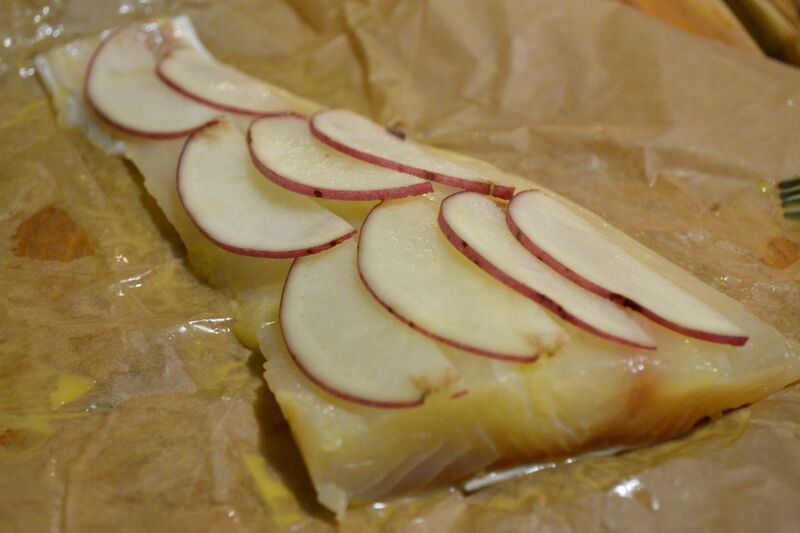 Bake or pan sear your whitefish (we used halibut) until tender and flakey. Set aside to cool. Brush store-bought wontons lightly on one side with olive oil and shape to fit the cups of a small muffin pan. Bake at 350 for about 10 minutes or until they are just golden and crispy. Fill the wontons with fish and pesto. A marmite is an earthenware pot traditionally used for making soups and stews. This recipe comes from Dieppe on the Normandy coast, well known for its excellent fishing. Basically, this is a simple seafood stew. I say “simple” because the instructions are not complicated. Everything is cooked separately, however, so there are a number of steps. It helps to have a set of extra hands. 🙂 The beauty of this stew is that every delicate bite retains its true flavor: scallops taste like scallops, mussels taste like mussels. You get the idea. It’s clean and fresh. Thanks to Krugers Market and Flying Fish! Pour the white wine into a large stockpot with lid. Add the shallot, thyme, bay leaf and mussels and bring to a boil. Simmer for 2-3 minutes. Remove the mussels and discard any that didn’t open. Set aside to cool. Bring the liquid to a boil again and add the shrimp (or langoustines) and scallops. Cover and cook gently for 2-3 minutes. Remove and set aside. Meanwhile remove the mussels from their shells and set aside with the other ingredients. 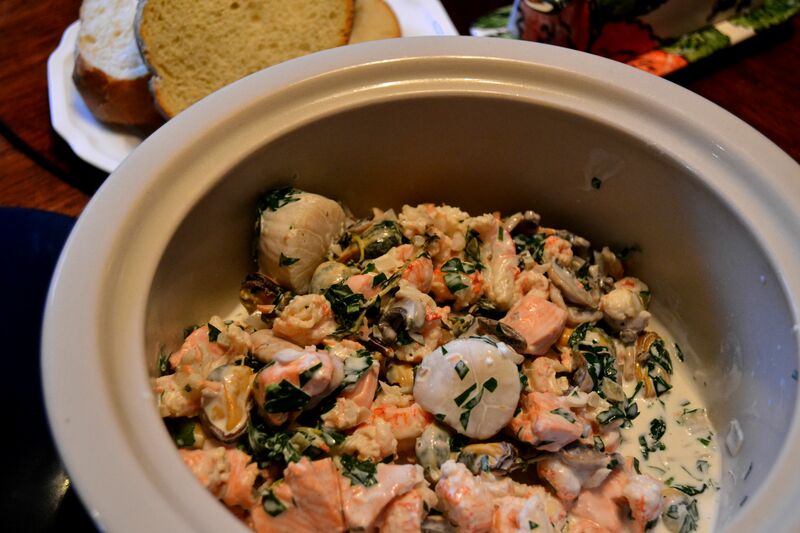 Chop the salmon into cubes, and slice the mushrooms. 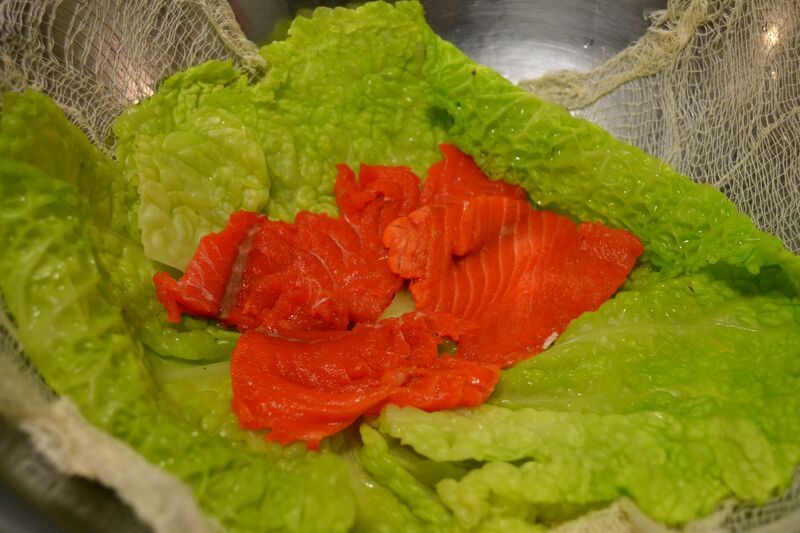 Add the salmon cubes to the liquid and poach, covered, for about 5 minutes or less. Remove salmon and set aside. Strain the liquid to remove any sand from the mussels and pour back into the pot. Add the mushrooms and cook until all liquid is absorbed or evaporated. Add the cream and stir on high heat to thicken. Gently add the chopped parsley, mussels, shrimp/langoustines, scallops and fish into the cream. Simmer for 3-4 minutes. Serve with crusty bread and white wine followed by a great dessert… Yum! I made these the night before because they have to set over night. The recipe says they should set for an hour, but I’ve found that to be overly optimistic. Put the berries, sugar and lemon juice into a blender or food processor and blend briefly (if you blend too long, they lose their vibrant color). Strain coulis to remove the seeds. That’s it. Line 4 3.5″ ramekins with enough cheesecloth so that it overlaps the tops. Whip the cream in a cold bowl until it trails, just shy of peaking. Add the softened cream cheese and whip until creamy. Stir in the confectioner’s sugar and spoon into lined ramekins. 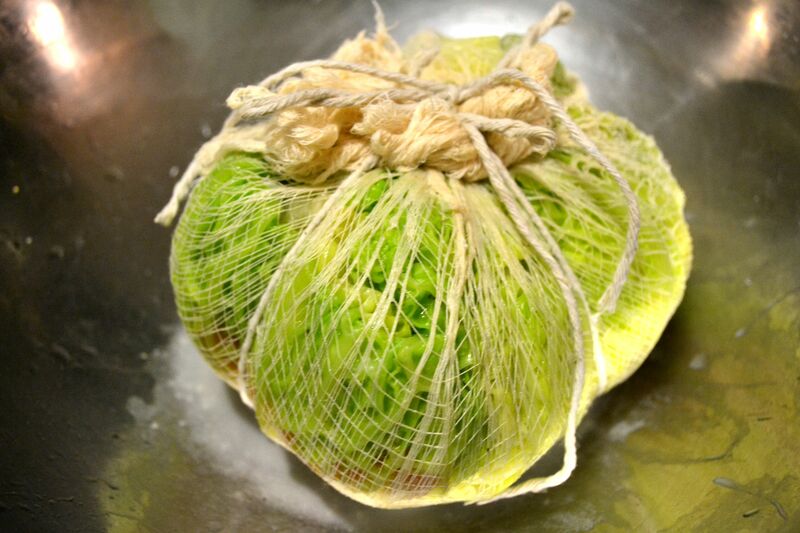 Fold the excess cheesecloth over to cover and refrigerate. Later (the next day, or many, many hours later), unmold the dessert onto a plate, peel away the cheesecloth and surround with coulis and berries. 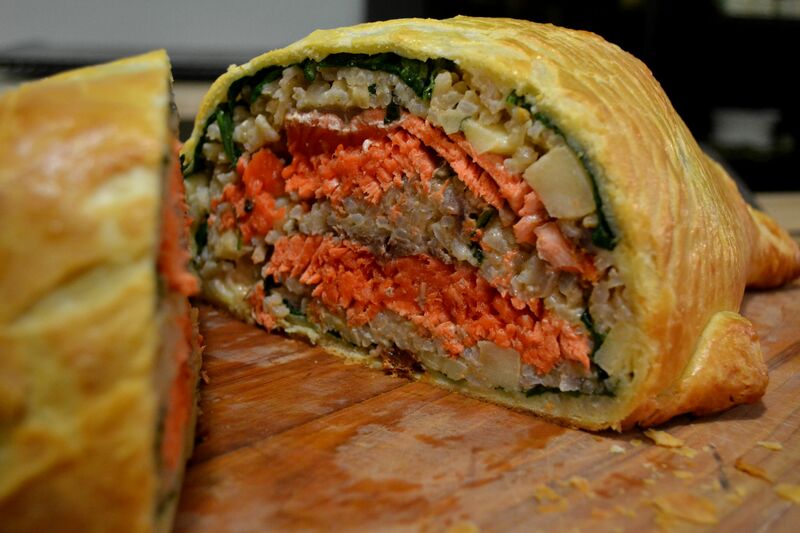 This particular Salmon en Croute is my own creation, and a variation on Michel Roux’s Salmon Coulibiac. 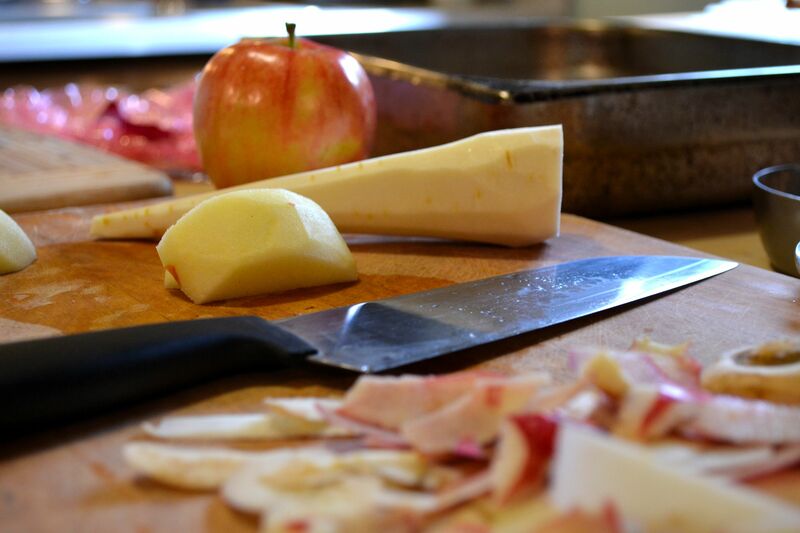 Instead of using mushrooms and white rice, I’ve made risotto with roasted parsnips and apples. Put the milk and yeast in a bowl and mix to dissolve. Blend flour, salt and eggs in a separate bowl. Add in the yeast mix and knead for 10 minutes. The dough should be smooth and elastic. Mix the butter and sugar separately, then add to the dough a little at a time. Mix on low until the butter is incorporated, then mix on medium until the dough is smooth and shiny and comes away from the sides of the bowl. Cover the bowl with cling film and proof for two hours or until the dough has doubled in size. After two hours, punch the dough down by turning it over twice. Refrigerate for several hours (but not more than 24 hours). I find that 2 or 3 hours can be enough if you’re pressed for time. 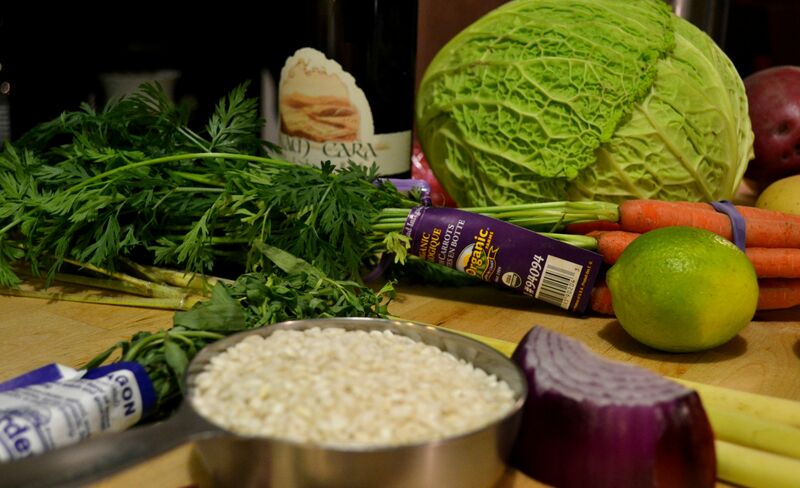 While the dough is chilling, start the risotto. Heat a skillet and saute the onion until transparent. 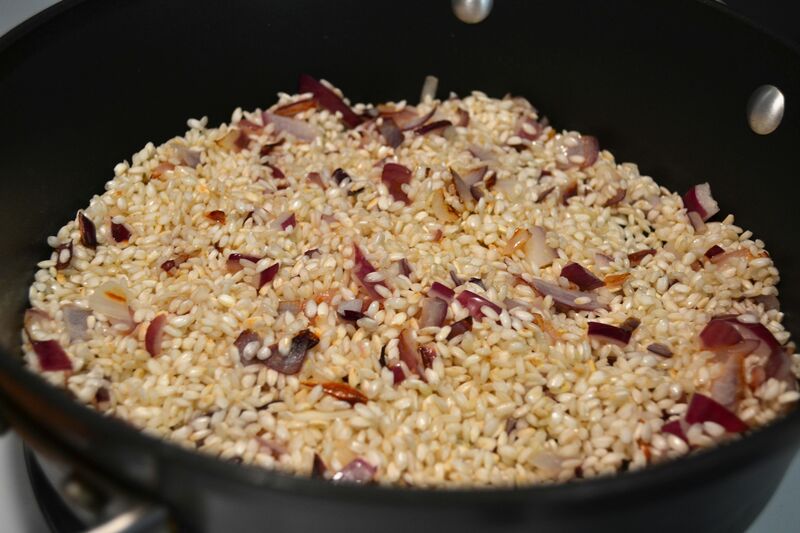 Add the rice and stir until just browned and coated with oil. Add the wine and cook down. Add the stock about 1/4 cup at a time, stirring constantly. Let the stock be absorbed each time before adding more. This process can take about an hour. 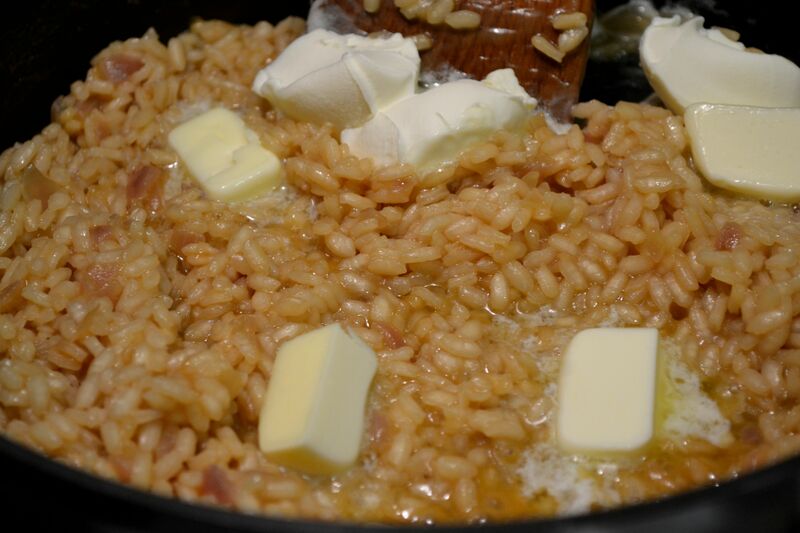 Once all the stock is absorbed and the risotto is creamy, add the butter and cheese. Add the remaining ingredients and stir. Let cool. I used a 2 lb filet, cut in half. 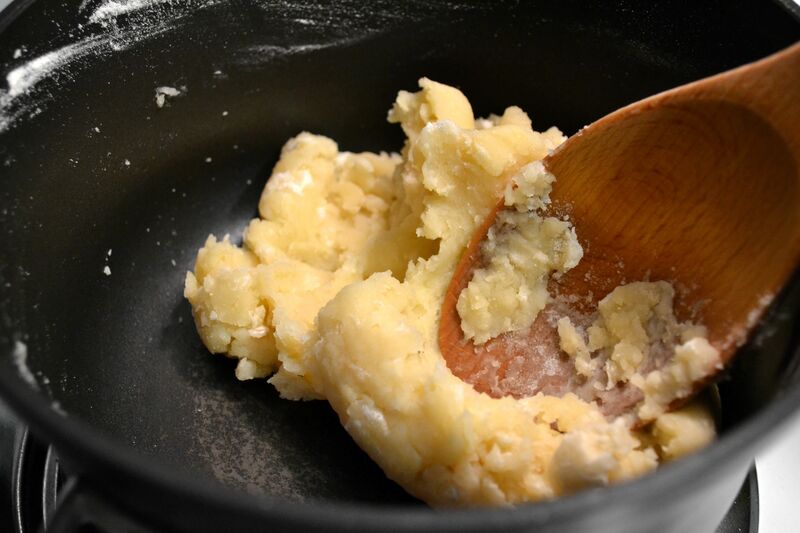 In a pan, melt about 1 tsp butter for each half. Score the skin side of each filet about 1/2 deep and place skin-side down in the pan for about 4 minutes on medium high. Watch the thick edge of the fish change color. When the pink is about 3/4 of the way up the edge, flip and cook the other side for 2 minutes. 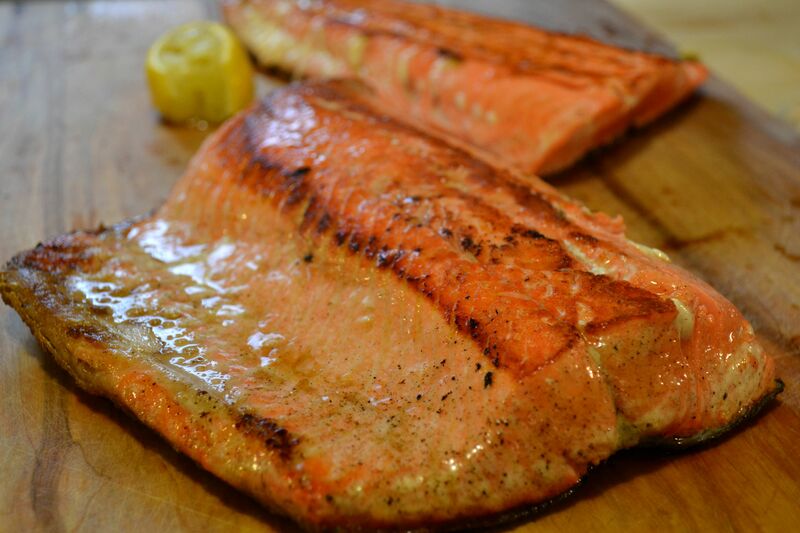 Set the salmon aside and let it cool. 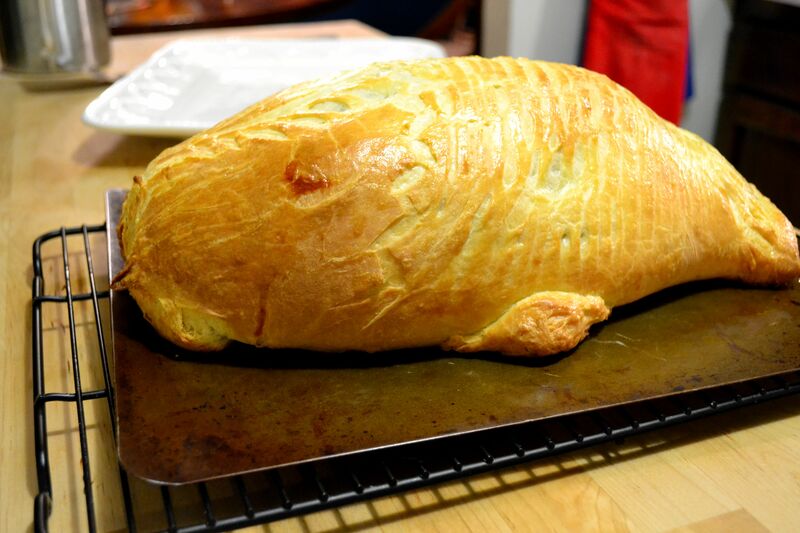 Roll the brioche out into a large rectangle about 12″ x 16″, depending on the size of your fish. 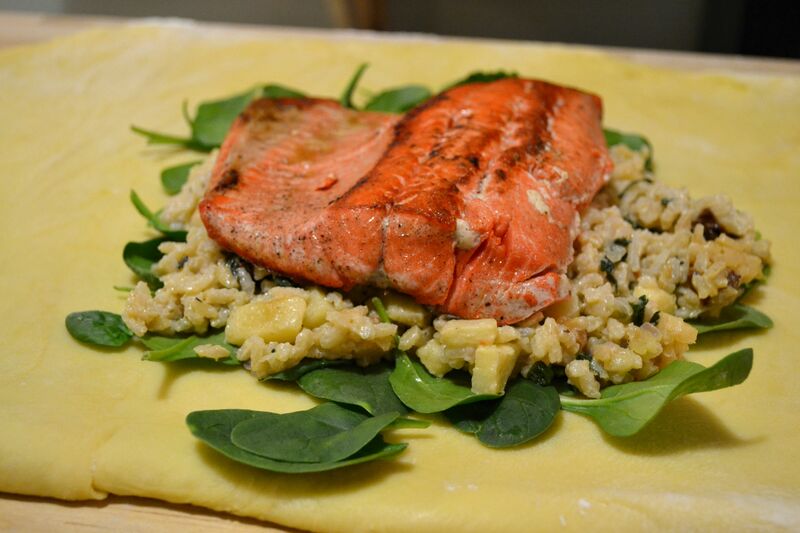 Some recipes call for crepes to line brioche, but I prefer to use spinach or phyllo dough. 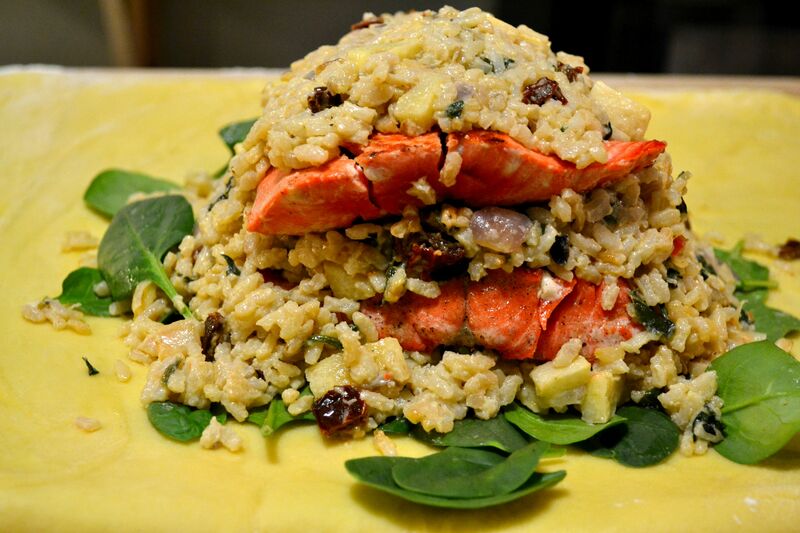 Layer risotto on a layer of spinach, and top with a filet. 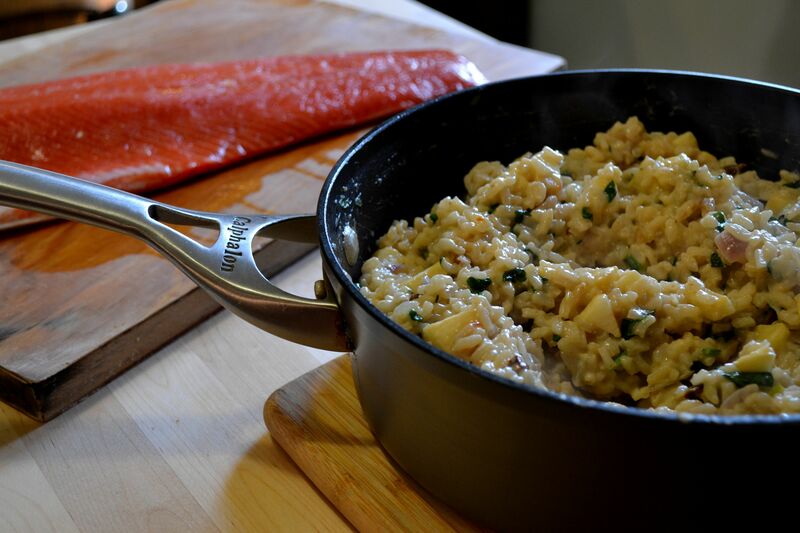 Now add another layer of risotto and salmon. Top with spinach. 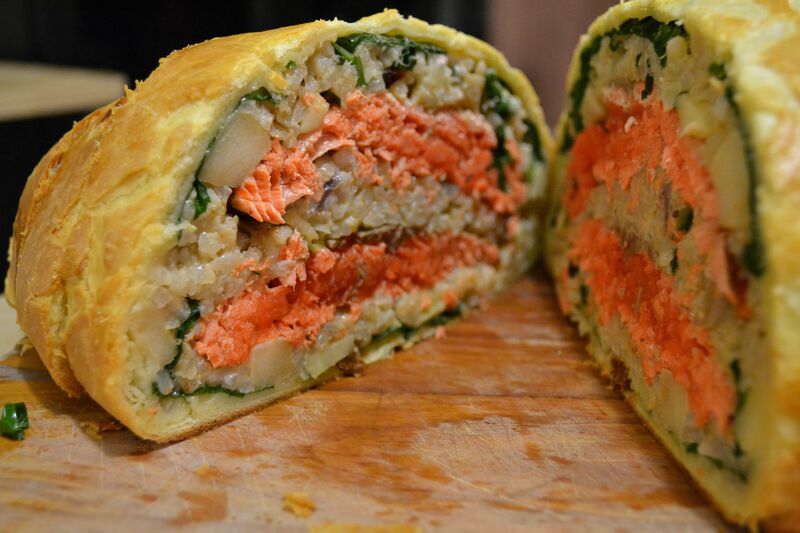 Fold the brioche over the salmon and risotto and overlap the edges. Seal the overlap with egg wash. Do the same for the ends and flip the piece seam down. Refrigerate for at least 30 minutes. Brush with egg wash and decorate with some flourishes or fish scales. Bake the brioche at 350 for 35-45 minutes, depending on how golden you like it. My dough came out nice and gold, but my “fish” ended up looking more like a baby seal. I’ll have to work on that next time. I wish the photo above was mine, but it isn’t. It’s from Haute Cuisine, the movie that inspired me to try and wing this dish. Mine didn’t turn out as pretty as this movie shot, but it did taste wonderful. I’ll have to keep experimenting with this one. 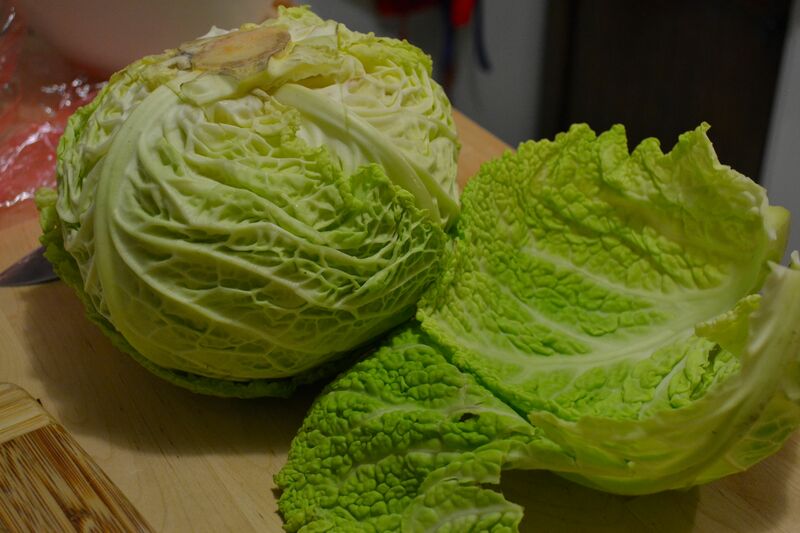 Find a beautiful cabbage and make cuts at the base to remove the outer leaves. 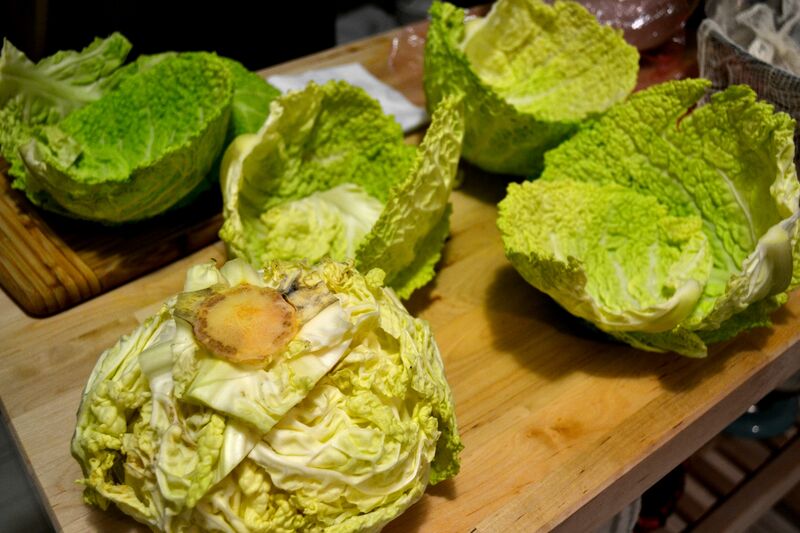 Remove several layers, depending on how thick your final cabbage will be. I only used 4 layers of leaves. Lightly boil the leaves in 1/2 water, 1/2 chicken stock. When slightly soft, remove to a bowl of cold water. Cut out the hearts so the leaves will lie flat. 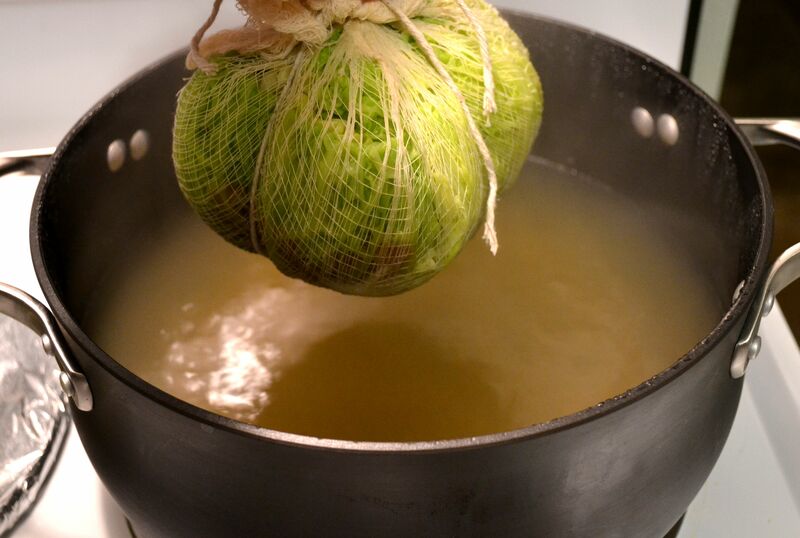 Line a large, shallow bowl with cheesecloth or muslin and lay the first layer of leaves. 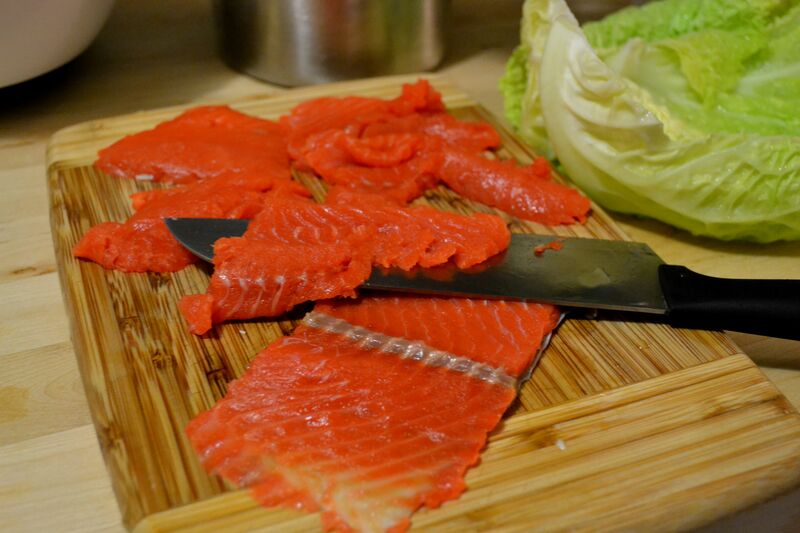 Slice the salmon very thin and layer on the leaves. Since I’m winging it, I added an additional layer of asiago mashed potatoes I had in the fridge. Then a second layer of the same (salmon, salt/pepper, potatoes) followed by a third and, finally, the last. 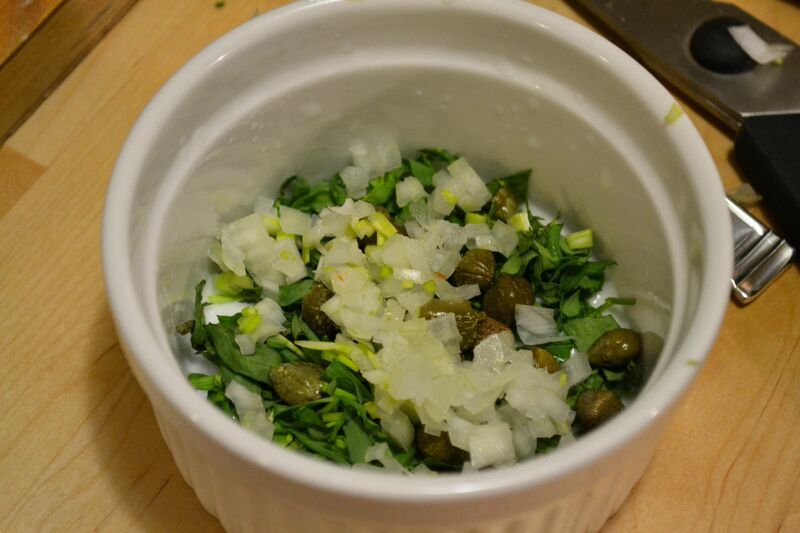 In the center, I also added a shallot and some dill. Wrap it all up in the cheesecloth and tie into a tight bundle. 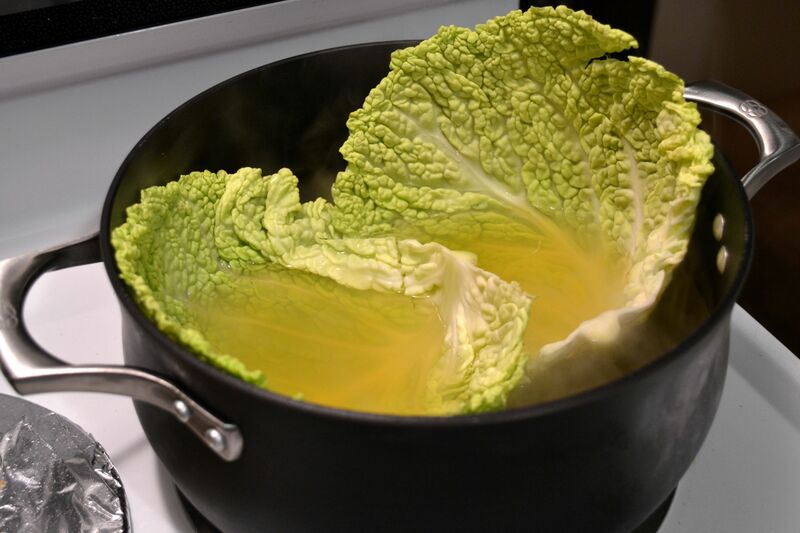 Drop it back in the stock for about 25-40 minutes, depending on the size of your cabbage. Remove, set aside to cool and drain. I’m not sure what kind of sauce is in the movie shot (hollandaise? ), but I think next time I would serve with a sauce. Until then, Choux Farci au Saumon sans sauce. Enjoy! 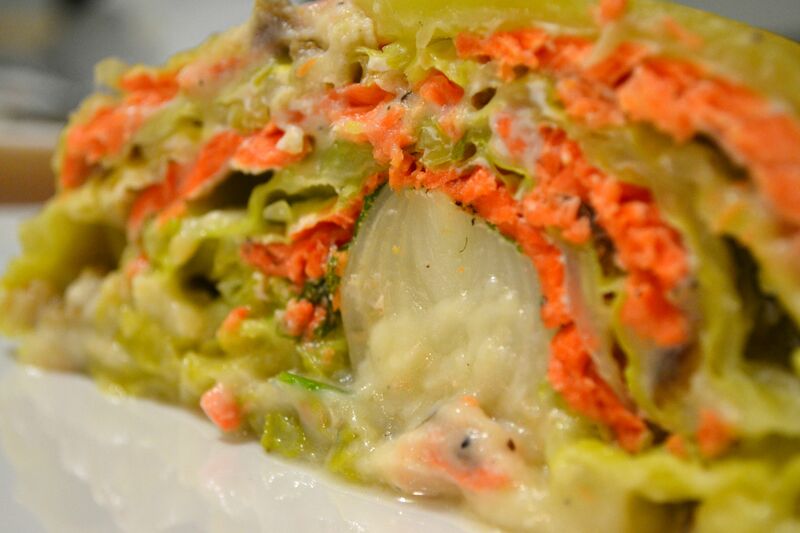 The recipe for this dish comes from Carlos’ French Restaurant in Highland Park, Chicago (now closed). 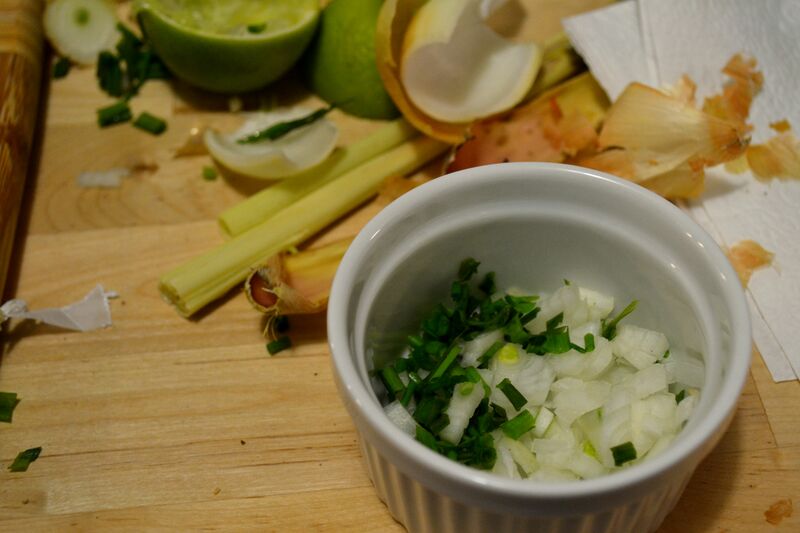 The recipe is longer than it needs to be, IMO, so I’m just going to talk about how to make the lemongrass sauce. It’s fabulous. 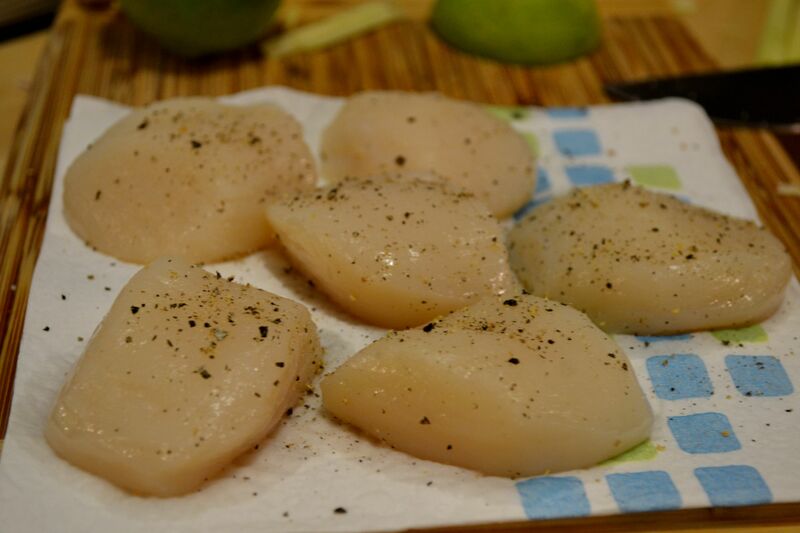 Aside from the sauce, just make sure you dry your scallops before searing them in about 1 tsp olive oil. That’s the trick to golden scallops. After removing the scallops from the pan, cook the spinach until just wilted. Remove and follow with asparagus, chanterelles (if you like), and sliced cherry tomatoes. Pour the cream into a large, heavy-bottomed saucepan and simmer. Add the crushed and sliced lemongrass. Cooked down until reduced by about half. Strain. Add the lime juice and simple syrup. Toss the cooked vegetables together with 1 tbsp chopped shallot, 2 tbsp unsalted butter and 1 tbsp minced chives. 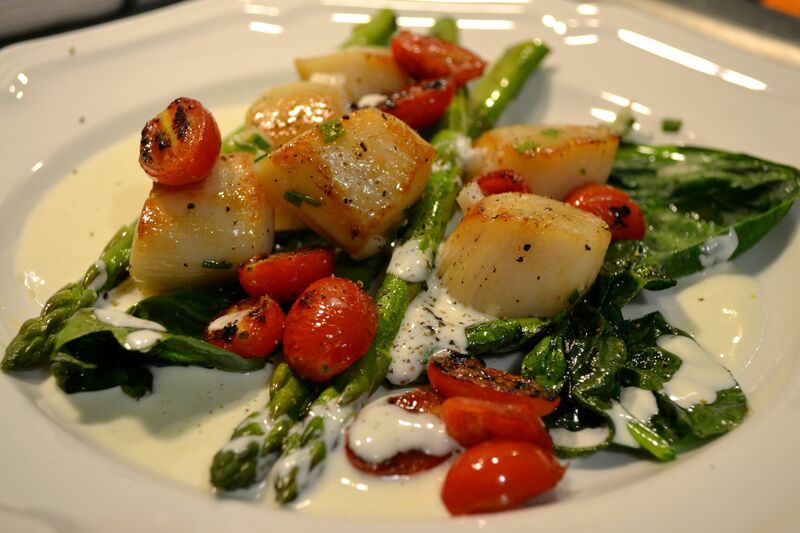 Pour a base of lemongrass sauce and plate vegetables and scallops on top. 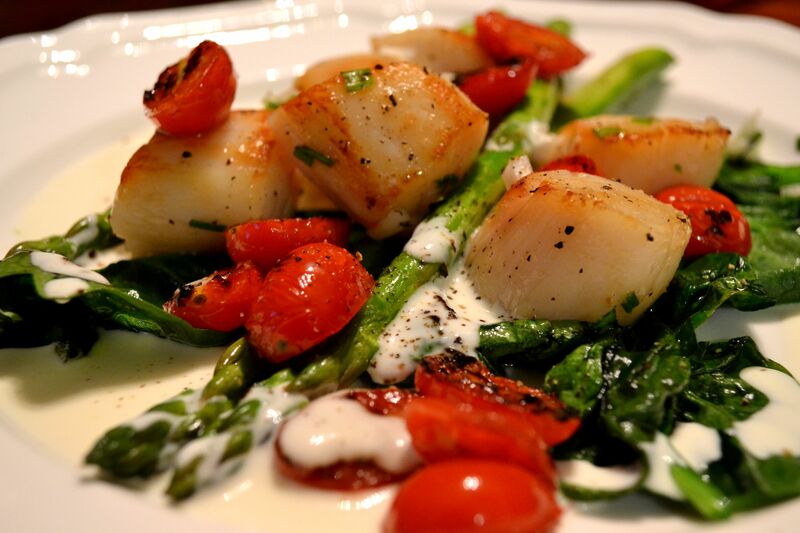 This sauce can be frozen for later to serve with shrimp, whitefish or more scallops. Enjoy! I watched a wonderful, French foodie movie for the second time recently, Haute Cuisine. It’s about President François Mitterrand’s personal chef, Danièle Mazet-Delpeuch, whom he hand-picked to create meals for himself and those closest to him. What a dream job. 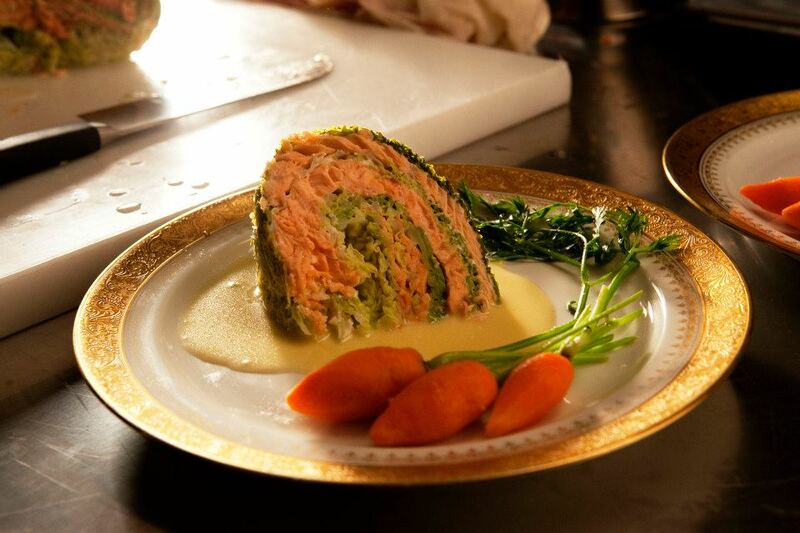 In this movie several dishes feature prominently, including a choux farci au saumon (cabbage stuffed with salmon)…. This shot is from the movie. 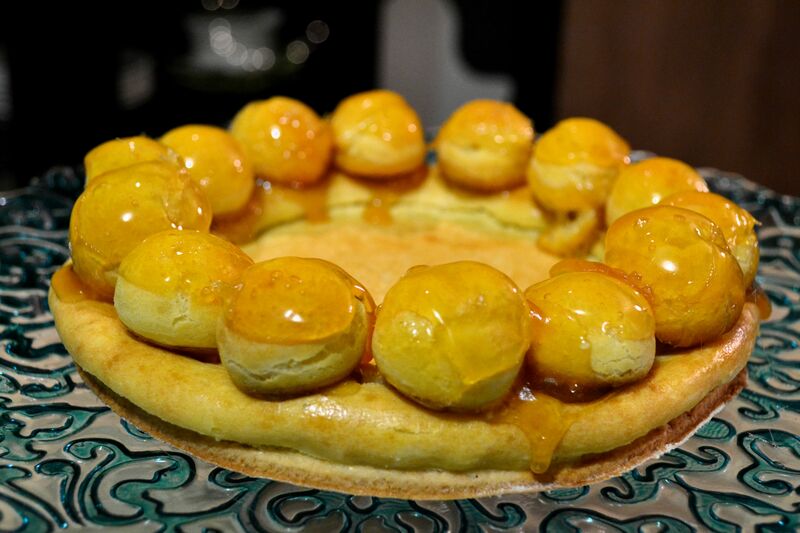 …and, of course, the Saint-Honoré. Élysée Palace, where the movie is set, is on Rue du Faubourg Saint-Honoré. 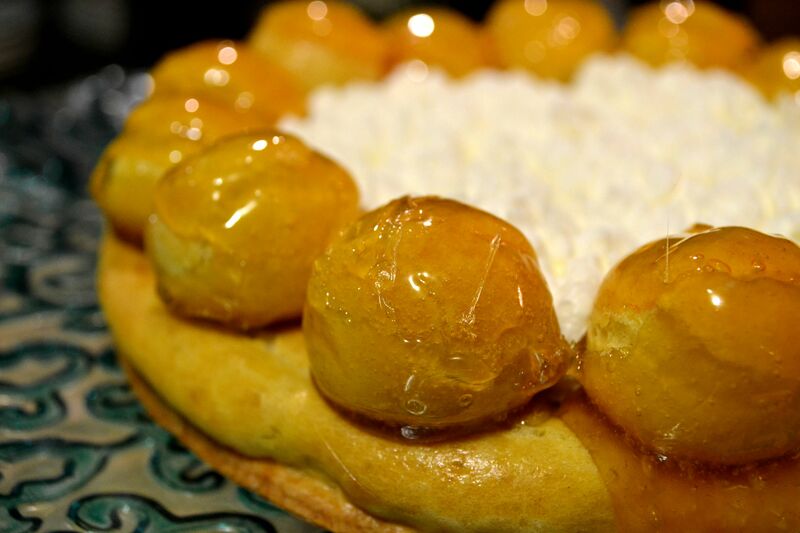 Saint Honoré is also the patron saint of bakers and pastry chefs. I’ve seen recipes that incorporate pastry creme or chocolate ganache, but I’m using a traditional recipe from one of my favorite cookbooks, Tarts and Pastries, by Le Cordon Bleu. 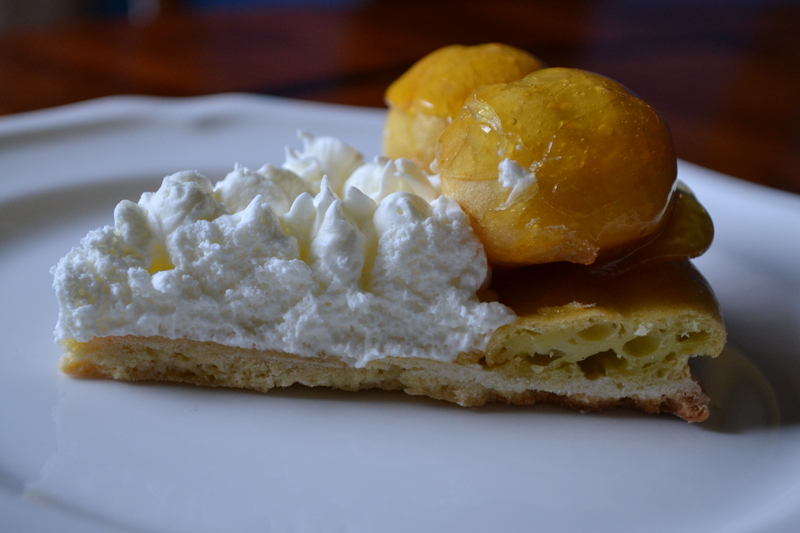 This version has four main components: sweet pastry, cream-puff pastry, Chantilly cream and caramel. Sift together flour and salt in a large bowl. 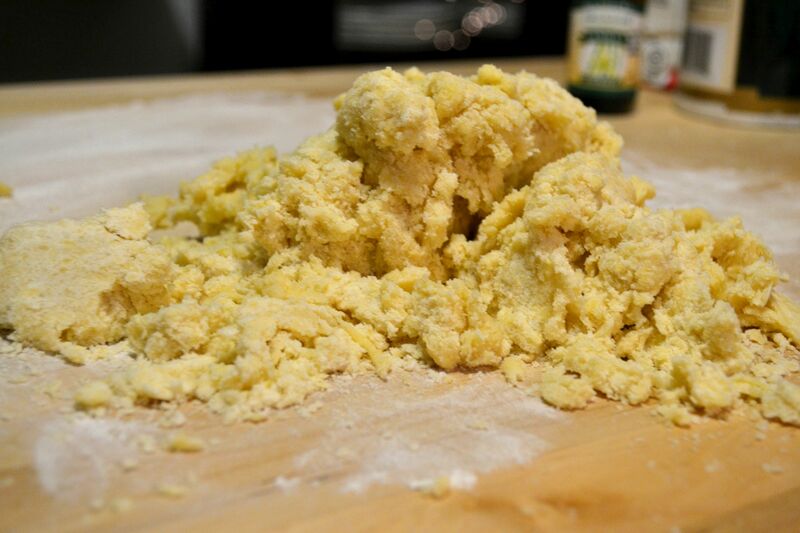 Cut the butter into 1/2″ cubes and rub into the flour until a course texture forms. Stir in the sugar and make a well for the combined egg and vanilla. Work dough together with a fork. Sprinkle with water to help with cohesion. 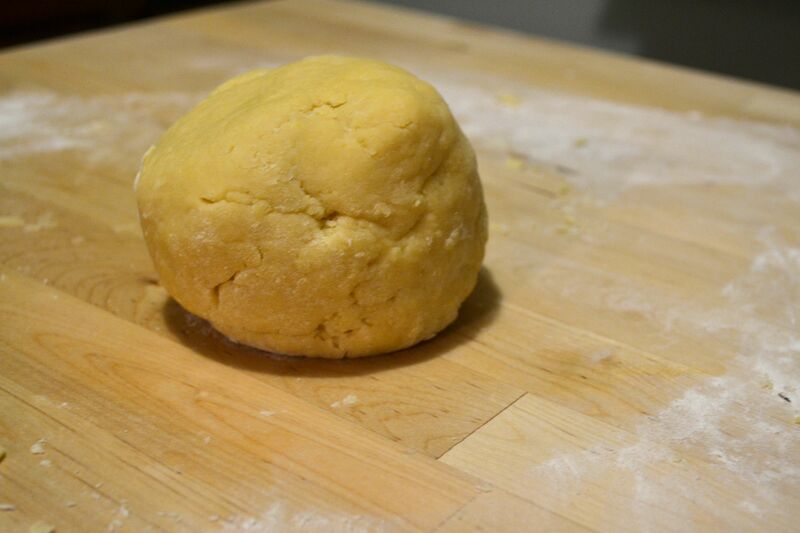 Transfer the dough onto a work surface and knead gently until smooth. 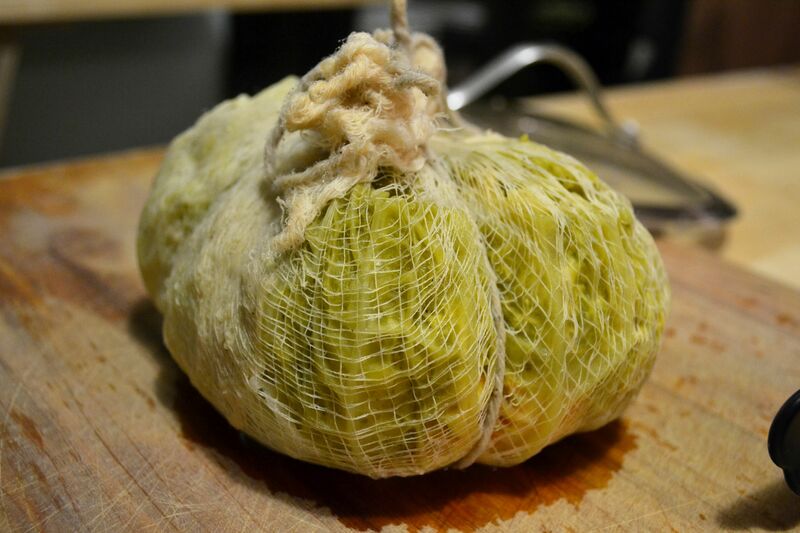 Wrap the ball of dough in cling film and chill for 20 minutes. Sift the flour onto a sheet of waxed paper. Put 1/2 cup of water, the butter, salt and sugar into a small, heavy sauce pan. Heat until boiling. Remove from the heat and add all the flour at once. 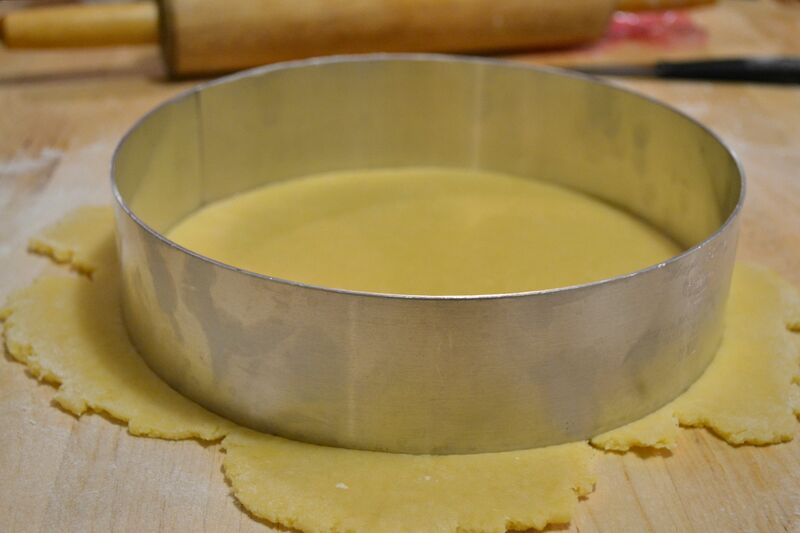 Stir well with a wooden spoon until the pastry comes away from the sides. 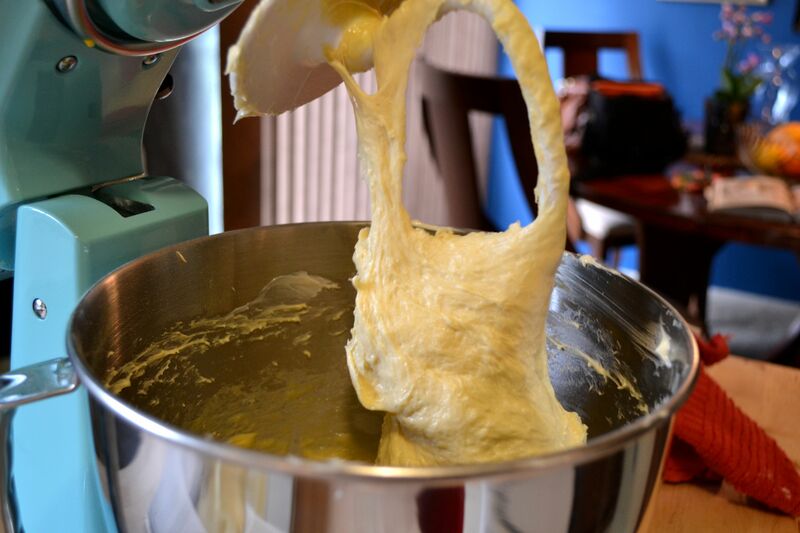 Put the dough in a bowl or mixer and add the beaten eggs a little at a time. 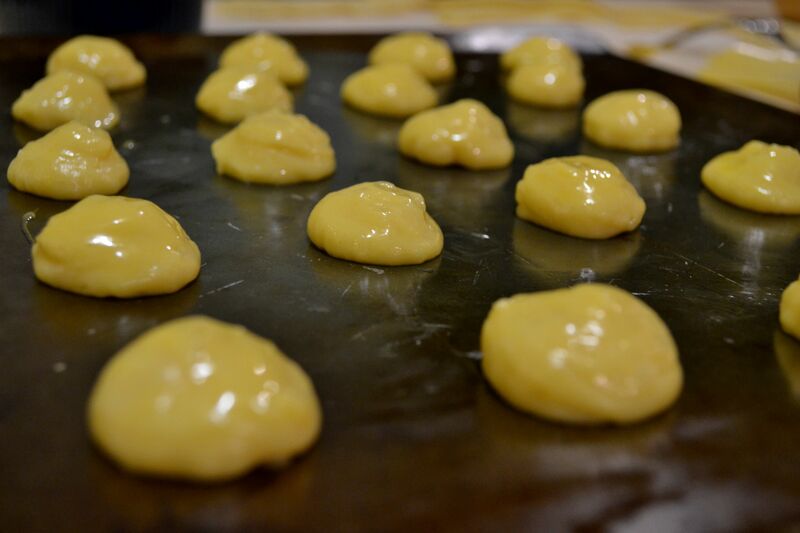 Continue to mix until the pastry is thick and glossy. Set aside. Preheat the oven to 350 degrees. Brush two baking sheets with melted butter and chill. 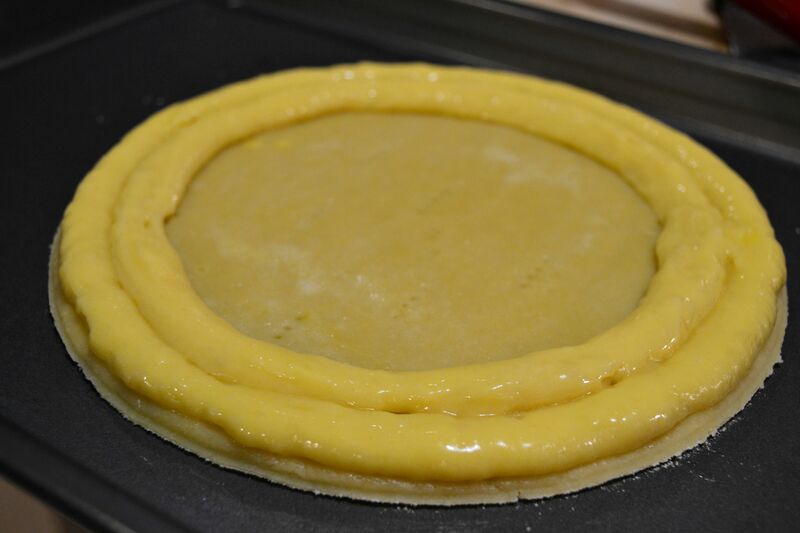 Roll the sweet pastry dough out to an 8″ circle about 1/8″ thick to form the base. Transfer to a baking sheet. Prick with a fork and brush with the beaten egg. 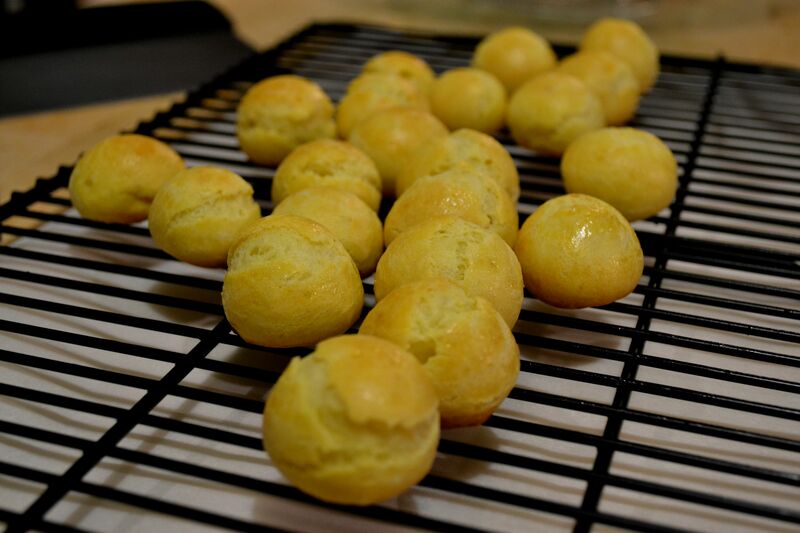 Pipe a ring of cream puff pastry around the edge of the base with a 1/2″ nozzle. Pipe a second ring inside the first. Bake for 40 minutes, or until golden. On the second baking sheet, pipe the puff-pastry into walnut-sized balls. Brush with beaten egg and smooth so they are uniform. Bake for 40 minutes, or until golden. Cool on a wire rack. While these are cooling, put 1 cup of sugar in a heavy saucepan with 1/4 cup water and heat until sugar dissolves. Increase the heat to boiling and reduce the sugar mix, stirring constantly. 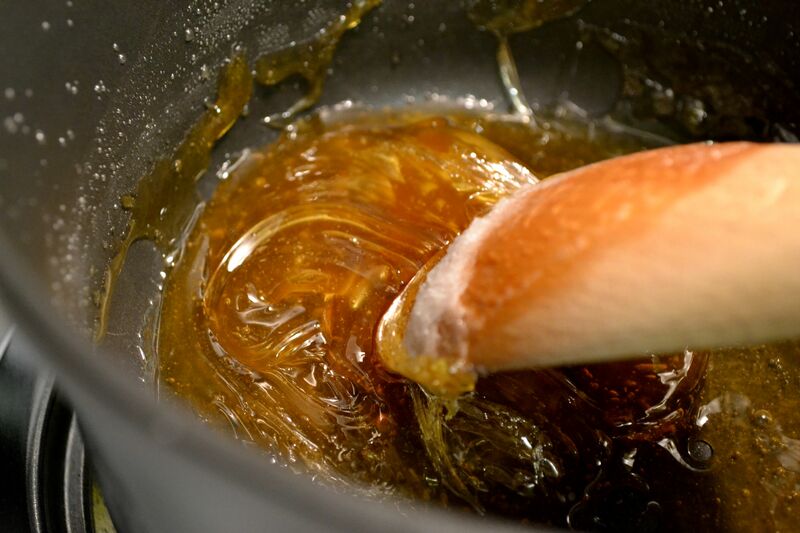 Simmer until the sugar is a golden caramel color. Remove from heat. Working very quickly, dip half each ball in the caramel and set aside to cool. You may need to reheat the caramel during this process. Dip a second time to cover the other half of each ball and place directly on the base rings. Try not to burn your fingers. Whip the cream in a chilled metal bowl until soft peaks form. Begin incorporating sugar and continue to whip, adding vanilla. Do not over whip. Pipe the cream onto the base with a star nozzle. Refrigerate at least 30 minutes before serving. This dessert should serve six very happy people. Serve with a strong coffee. Enjoy! 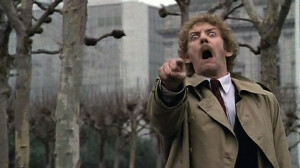 I welcomed 2014 in an unceremonious fashion: on the couch in my jammies, sipping camomile tea, watching the 1978 classic, Invasion of the Body Snatchers. Just me and my Tylenol. The movie was fitting because two days earlier I had indeed been taken over – absolutely tackled – by something diabolical. Finally, feeling better on New Year’s Day (and having had nothing but grits and crackers for two days), I’m celebrating by making some real food. This flakey fish is made crisp with a light coating of fried potatoes. 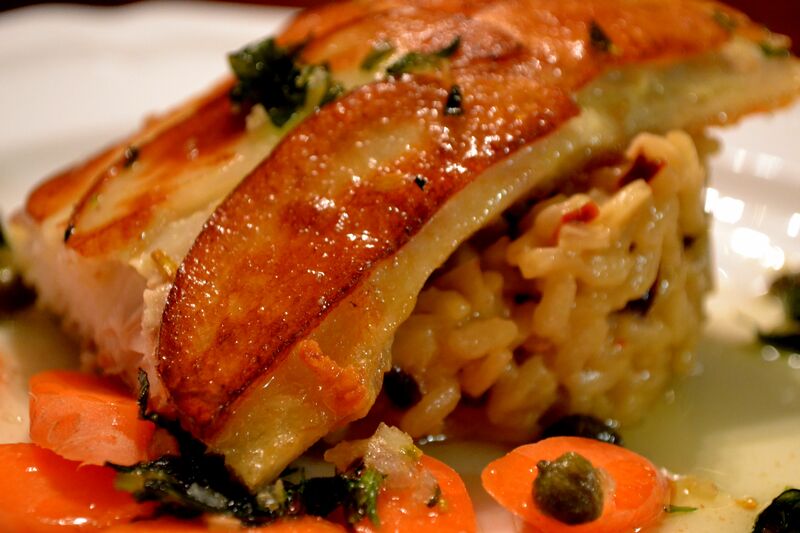 The risotto is creamy and full; the aroma of the tarragon sauce is enticing. 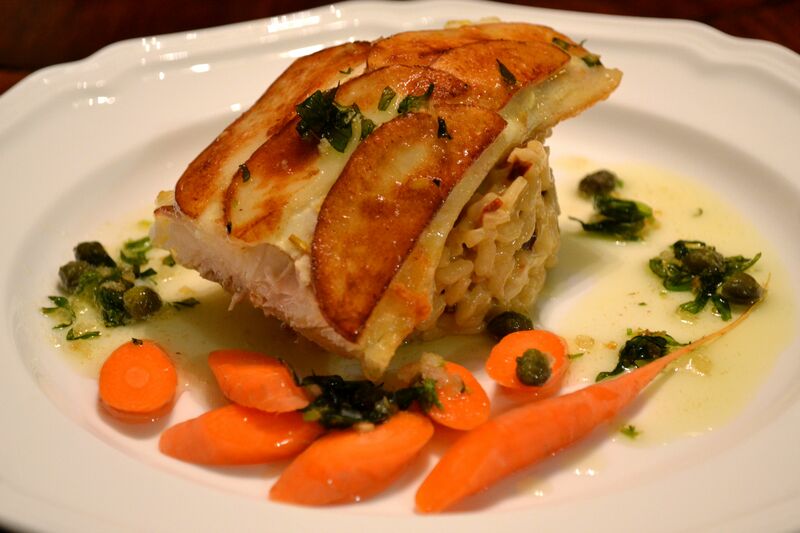 The mix of textures (crispy potato against the smooth risotto) makes each bite fabulous. Heat a skillet and saute the onion until transparent. Add the rice and stir until just browned and coated with oil. Add the wine and cook down. Add the stock about 1/4 cup at a time, stirring constantly. Let the stock be absorbed each time before adding more. 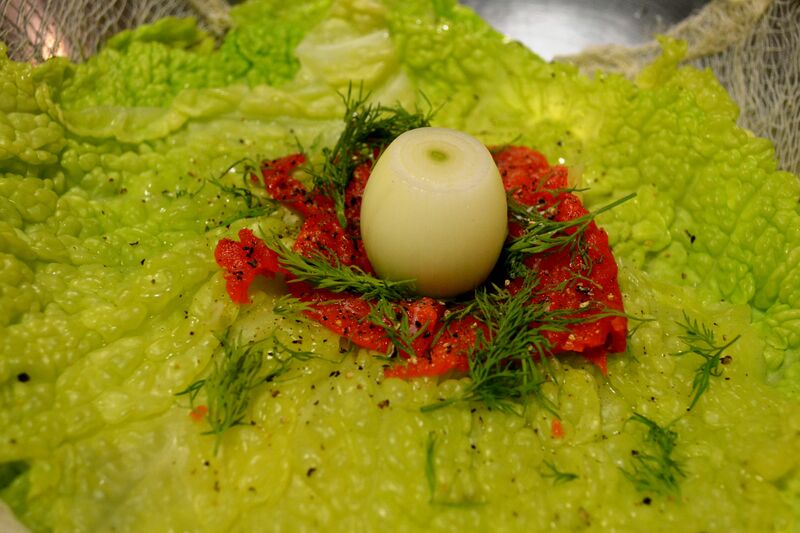 Brush the fish with beaten egg. The recipe says to cut a potato into 1/2″, very thin squares but I kind of wanted a “fish scale look” so I did things differently. This isn’t baking, after all, so we can play a bit more. 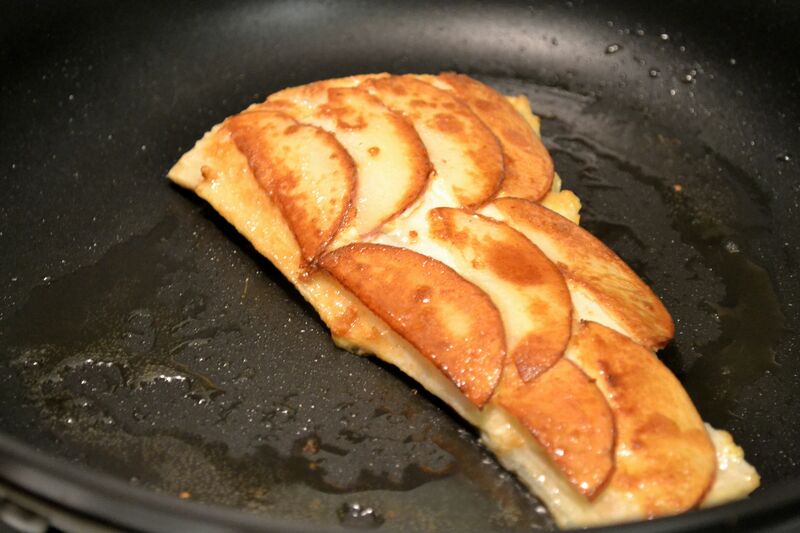 Lay the thin potato slices on the fish and brush again with beaten egg. You’ll want them to stick. Stir the risotto! Stir the risotto! 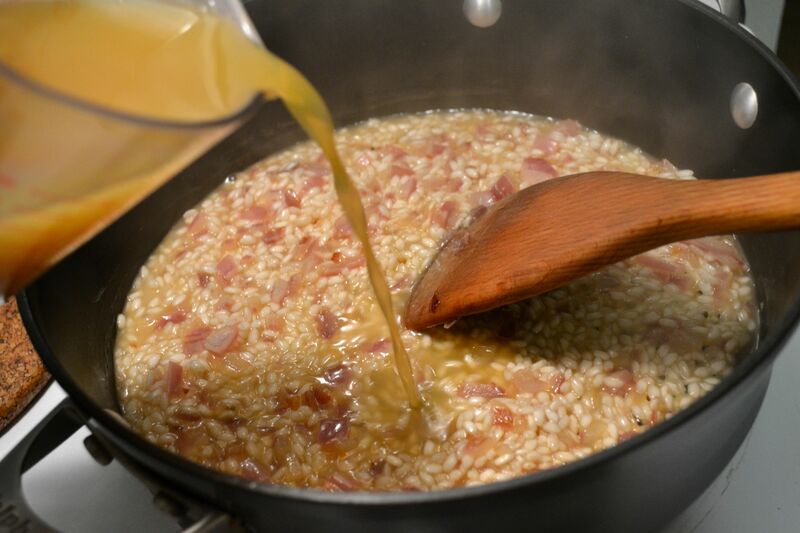 Once all the stock is absorbed and the risotto is creamy, add the butter and cheese. Add the remaining ingredients and stir. Cover to keep warm. Heat about 1-2 tbsp of oil in a large non-stick pan on med-high. I used 1/2 olive oil, 1/2 canola oil. Once the oil is hot, gently and ever so carefully place the fish (potato-side down) in the pan. Cook until crispy, but don’t flip it until it’s really ready. You can check the thick end of the fish to watch the color change as it cooks. When the color is white (or “done”) about 3/4 of the way up the fish, flip it. It usually takes about 3 minutes for an 8 oz piece, then 1-2 min on the other side, depending on thickness. 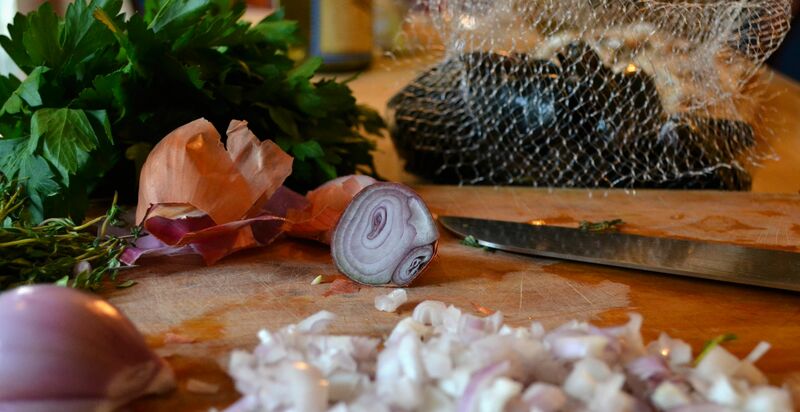 While the fish is cooking, quickly gather your sauce ingredients. Remove the fish from the pan and drain the excess oil. In the same pan, melt and lightly brown the butter. Once browned, toss in the other ingredients and stir to combine. 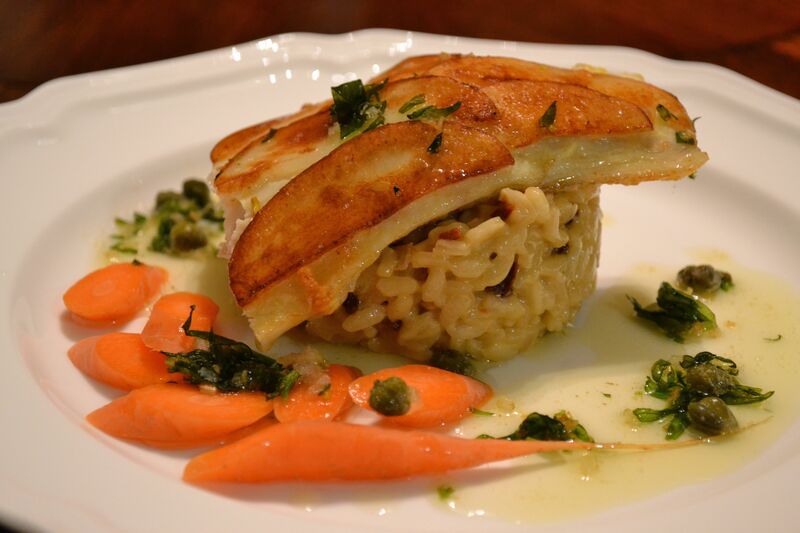 To serve, use a ring mold to form the risotto and place the fish on top. Drizzle with tarragon sauce. Chopped carrots make a nice compliment, as do olives and a clean Chablis. Wishing you health, great food and the good sense to appreciate both. Happy New Year!